No time to second guess a hurricane or a tropical storm, here at the studio we’re grateful Rocky and his 6-member crew of Ohana Tree Services were able to trim three large trees today, prior to Hurricane Olivia’s visit to Hawai‘i. They did a great job, cleaned up all the debris, and hauled it away. We traded cooling shade for better air flow around the property and a lot more daylight. Whether Olivia blows strongly or not, it was time for the trimming. We got a great deal from this professional company with a price that was 37% of the next lowest bid. Now the kou looks like a lollipop and is without its orange-hued lei flowers for a while. Thankfully the avocado was finished bearing its last three fruit for the season. Hopefully the mango will get the message and give us a crop for next time. As for the Maafala breadfruit, Rocky said to wait until the fruits are ready, and then he will come back to help harvest the tree and trim it at the same time. From the studio garden and the neighbors’ gardens—this morning’s harvest of ulu (breadfruit Maafala v.), maiʻa (banana), avocado, and calamansi (a citrus). Happy Thanksgiving, everyone! Comments : Comments Off on Home harvest. Lonoikamakahiki! The avocado, calamansi, and Hawaiian chilies are from my garden. So abundant! A couple of firm-ripe avocados rolled into the yard from the neighbor’s tree. So for the full moon gathering of goddesses last night, I decided to make fresh guacamole the way gourmet cook Honoli’i Mike makes it. Finely diced, not mashed. That way you retain the texture of the fruit, and each little dice is coated with the other ingredients. Mike said he makes his simple. Doesn’t add much of anything else, just a little lime juice. Food lover that I am, I examined his delectable mixture and detected more than lime juice. To lime juice in a large mixing bowl I substituted garlic chives for cilantro and added the juice from a calamansi, salt, black pepper, and a lot of minced red onion. 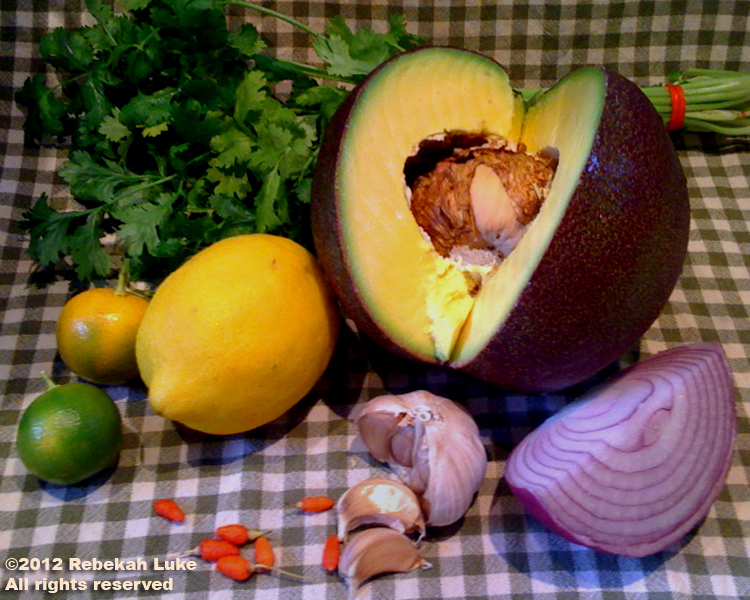 I stirred these ingredients well, then folded in the avocado and chilled the guacamole until party time. One of last night’s delightful goddesses is Mexican, and she pronounced it “Good!” I think I’ll make guacamole Mike’s way from now on. 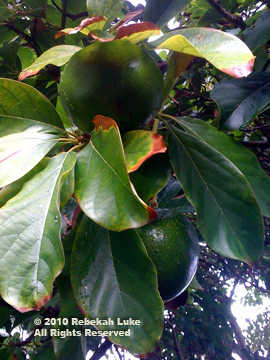 Our 2010 avocado season is one of the better. These luscious gems are overhanging the healing space near the studio right now. It’s an awesome sight to me. I can just reach up and pluck them to eat, in about 7-10 days. They will be so yummy. This year there are twice as many than years past. Who knows why, but I’m not complaining. Is the big old rusting anchor next to the tree finally providing enough iron? Or ditto the VW bug left there by DH 20 odd years ago? Did my cleaning out the heliconia patch allow it to breathe more? Or did the March winds blow off fewer flowers? Perhaps the tree liked the fertilizer left by the chickens and the peacocks. 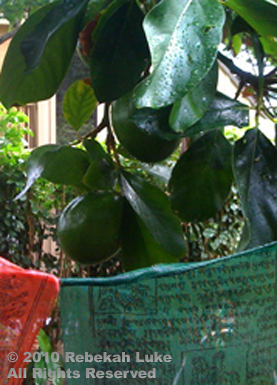 My neighbors have beaucoup limes on their tree, so likely we will trade and make guacamole. But most of the time I prefer eating avocados with a spoon plain, in their own natural bowl, all the way to skin, with just a little salt and pepper.